CloudPhysics should know a little something about the complexities of VMware (s vmw) deployments. Its CEO, John Blumenthal, is a VMware alum. And its investors include VMware co-founders Diane Greene and Mendel Rosenblum along with the Mayfield Fund, Mark Leslie, Ed Bugnion, Peter Wagner, Carl Waldsburger and Matt Ocko. But other than that funding news it has been pretty quiet. Until now. Tuesday, the company will unveil its Knowledge Base Advisor, a collection of notes, articles and other resources garnered from multiple vendors in the VMware ecosystem meant to help companies guide updates and upgrades to their VMware environments, Blumenthal told me. With CloudPhysics new SaaS-based knowledge base, you can track your specific configurations and be alerted to potential gotchas. A recent example of a big issue was a major incompatibility between vSphere and NetApp’s ONTAP management interface, he said. Most people found out about that the hard way. A little advanced notice could have prevented some big headaches. “We continuously analyze your operational data and relate it to a massive index of knowledge base articles and other unstructured data we manage. 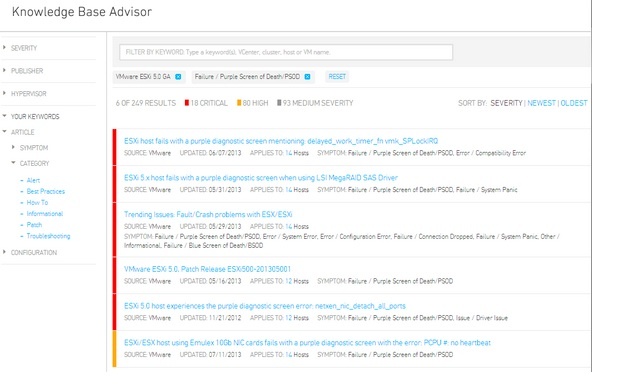 We call this a ‘relevance matching engine’ for finding the exact vendor issue alerts personalized for specific components and configurations in your environment,” he said. To be clear, this is not active management, but the company is adding analytics to inform IT decisions. The long-term goal is for CloudPhysics to do for intelligent infrastructure management what New Relic has done for application performance, Blumenthal said.